Where is the spinal cord? Close-up of spinal cord and dorsal and ventral roots. The spinal cord runs from the medulla oblongata of the brainstem down to the first or second lumbar vertebrae of the vertebral column (aka the spine). The spinal cord is shorter than the vertebral column, and overall is a surprisingly small structure. It is only about 16.5-17.5 inches long on average, with a diameter of less than 1/2 an inch at its widest point. What is the spinal cord and what does it do? The spinal cord is one of the two major components of the central nervous system (the other being the brain); its proper functioning is absolutely essential to a healthy nervous system. The spinal cord contains motor neurons that innervate skeletal muscle and allow for movement as well as motor tracts that carry directives for motor movement down from the brain. The spinal cord also receives all of the sensory information from the periphery of our bodies, and contains pathways by which that sensory information is passed along to the brain. Watch this 2-Minute Neuroscience video to learn more about the exterior of the spinal cord. Motor neurons leave the cord in collections of nerves called ventral rootlets, which then coalesce to form a ventral root. Sensory information is carried by sensory neurons in dorsal roots, which enter the cord in small bundles called dorsal rootlets. The cell bodies for these sensory neurons are clustered together in a structure called the dorsal root ganglion, which is found alongside the spinal cord. The ventral root and dorsal root come together just beyond the dorsal root ganglion (moving away from the cord) to form a spinal nerve. spinal nerves by spinal cord segment they emerge from. 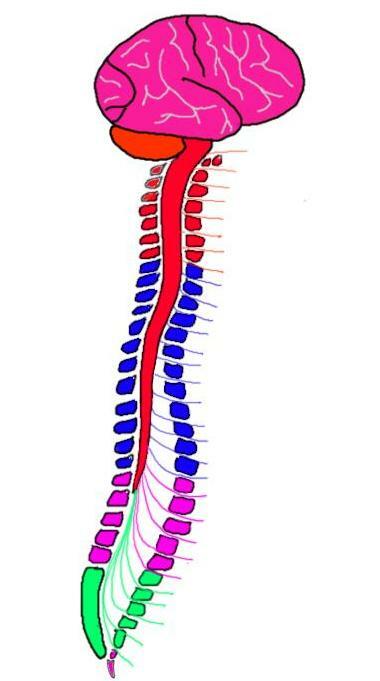 Red = cervical, blue = thoracic, pink = lumbar, green = sacral. Spinal nerves travel to the periphery of the body; there are 31 pairs of spinal nerves in total. Each area of the spinal cord from which a spinal nerve leaves is considered a segment and there are 31 segments in the spinal cord: 8 cervical, 12 thoracic, 5 lumbar, 5 sacral, and 1 coccygeal. The spinal cord terminates in a cone-shaped structure called the conus medullaris, which is usually found at around the first or second lumbar vertebrae (L1-L2). However, the spinal cord (like the brain) is surrounded by protective membranes known as the meninges, and the meningeal layers known as the dura mater and arachnoid mater continue for several more segments (to about the second sacral vertebrae) beyond the end of the cord itself. Because this extension of the meningeal covering of the cord--sometimes referred to as the dural sheath--continues past the end the cord, it creates a cerebrospinal fluid-filled cavity known as the lumbar cistern where there is no cord present. Additionally, although the conus medullaris is found at around L2, there are still several pairs of spinal nerves that must travel to the lower half of the body from the final segments of the cord. These nerves travel through the lumbar cistern; the straggly collection of fibers here is referred to as the cauda equina because it resembles a horse's tail. Cerebrospinal fluid is often taken from the lumbar cistern if it needs to be sampled for testing (e.g. for meningitis). This procedure is known as a lumbar puncture or spinal tap; it is done from the lumbar cistern because there is little risk of damaging the spinal cord by inserting a needle there (since the cord is not present at that level of the vertebral canal). The spinal cord is attached to the end of the dural sheath by a thin extension of the pia mater known as the filum terminale. The filum terminale also extends from the end of the dural sheath to attach the spinal cord to the tailbone. In both cases, the filum terminale helps to anchor the cord in place. When you look at the spinal cord in cross-section (at any level) you will see what some describe as an H-shaped or a butterfly-shaped area of grey matter surrounded by white matter. The grey matter consists of cell bodies of motor and sensory neurons, and is divided into three regions. The area closest to the back of the spinal cord is called the posterior horn. This area consists of cell bodies of interneurons whose processes don't leave the spinal cord and neurons whose processes enter ascending tracts to carry sensory information up the cord. The substantia gelatinosa is an area of the posterior horn that is specialized to deal primarily with fibers carrying pain and temperature information. Watch this 2-Minute Neuroscience video to learn more about the spinal cord in cross-section. The area of the grey matter closest to the front of the spinal cord is called the anterior horn. It contains the cell bodies of lower motor neurons. These neurons leave the spinal cord in the ventral roots and project to skeletal muscle. They are responsible for all voluntary and involuntary movements. The section of grey matter between the anterior and posterior horns is referred to as the intermediate grey matter. There is not a clear division between the anterior and posterior horns and the intermediate grey matter, so the intermediate grey matter contains some neurons that have characteristics similar to those found in each of the horns. It also contains a variety of interneurons involved in sensory and motor transmission. But the intermediate grey matter has unique functions as well, for it contains the cell bodies of autonomic neurons that are responsible for mediating involuntary processes in the body. These neurons are involved in internal organ functions that are not generally under conscious control, such as heart rate, respiration, digestion, etc. The white matter that surrounds the grey matter is made up of bundles of ascending and descending fibers known as funiculi. Although the funiculi serve diverse functions, they are often grouped according to location into the: posterior funiculi, lateral funiculi, and anterior funiculi. Each of these funiculi are made up of a variety of ascending and descending tracts, but the funiculi are frequently associated with a small number of important, well-defined tracts whose fibers are carried within them. For example, the posterior funiculi contain the posterior columns, important fibers that carry information regarding tactile (i.e. touch) sensations and proprioception to the brain. At the level of the medulla, these fibers form the medial lemniscus, another tract that continues to carry the information on to the thalamus and somatosensory cortex. The whole pathway (from the spinal cord to the somatosensory cortex) is often referred to as the posterior (or dorsal) columns-medial lemniscus system. The lateral funiculi contain important fibers that carry pain and temperature sensations to the brain. These fibers (some of which enter the lateral funiculi from the substantia gelatinosa) are part of what is called the anterolateral system, which consists of several pathways that carry information regarding painful sensations to various sites in the brain and brainstem. The tracts that are part of the anterolateral system include: the spinothalamic tract, which is important for creating awareness of and identifying the location of painful stimuli; the spinomesencephalic tract, which is involved in inhibiting painful sensations; and the spinoreticular tract, which is involved in directing attention to painful stimuli. The lateral funiculi also contain an important motor pathway: the corticospinal tract. The corticospinal tract fibers originate in the cerebral cortex (e.g. the precentral gyrus or primary motor cortex) and synapse on alpha motor neurons in the anterior horn. These alpha motor neurons then travel to skeletal muscle to initiate movement, and therefore the corticospinal tract plays an important role in voluntary movement. The anterior funiculi aren't defined by a specific tract that travels through them. They contain a variety of ascending and descending tracts, including some fibers from the corticospinal tract. Thus, the spinal cord acts as the intermediary between the brain and the body, and all sensory and motor signals pass through it before reaching their final destination. This is why a healthy spinal cord is crucial and damage to the spinal cord can be debilitating or life threatening.